The UK Quad for the much loved classic. 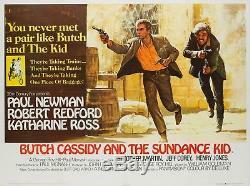 Butch Cassidy and the Sundance Kid. Features some of the strongest artwork for the title. In fantastic, unrestored folded (as issued) condition. UK Quad (30 x 40 inches). Very light cross-fold wear, light wear and nicks on edges. Crease on bottom right hand corner. The item "Original Butch Cassidy and the Sundance Kid, UK Quad, Film/Movie Poster 1969" is in sale since Tuesday, March 13, 2018. This item is in the category "DVDs, Films & TV\Film Memorabilia\Posters\Originals - UK Quads\1970s".